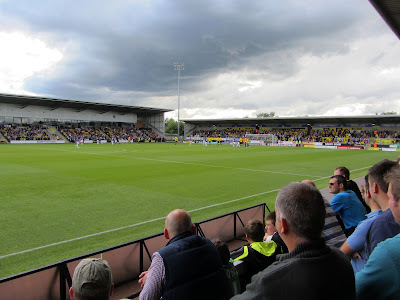 My twentieth stadium of 2013 was on Saturday 7th September 2013 at the Pirelli Stadium in Burton-upon-Trent, Staffordshire. 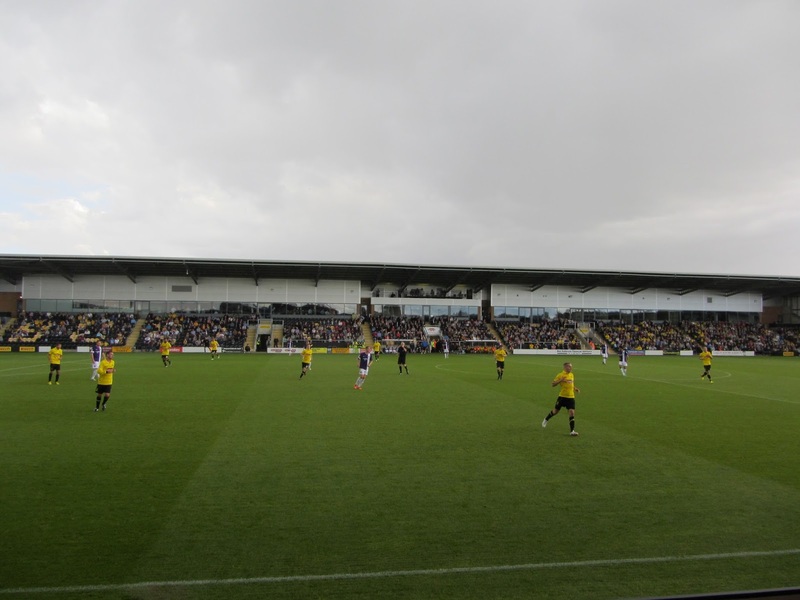 The match was Burton Albion vs. Oxford United in Football League Two. The Pirelli Stadium is in the north-east part of the town and sits next to the a Pirelli factory. The ground was built on the site of the company's former sports and social club with the land donated to the club in exchange for the stadium naming rights. 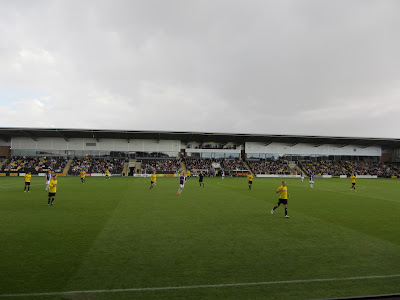 The venue sits 1.3 miles from Burton-on-Trent railway station and has been home to Burton Albion since 2005 when they left their former home of Eton Park. The Main Stand runs alongside the pitch on the southern section of the venue. This contains the reception, ticket offices, club shop and player dressing rooms. The stand is an all-seater structure with a capacity of 2,034 with the hospitality areas located behind the main seating. A section of around 400 seats at the eastern end of the structure is given over to away fans. The rest of the ground is taken up with covered terracing. Opposite the Main Stand is the Popular Side which includes a bar facing out towards the car park. The areas behind the two goals are also taken up with terracing - the home fans take up the West Terrace with the East Terrace holding away fans. The combined capacity of the terraced stands is just under 5,000 giving an overall stadium capacity of 6,912. The game was fought out between two sides near the top of the League Two table though the football on display in the first half wasn't great. The ball seemed to spent most of the first 45 minutes in the air and there were not many meaningful attacks. 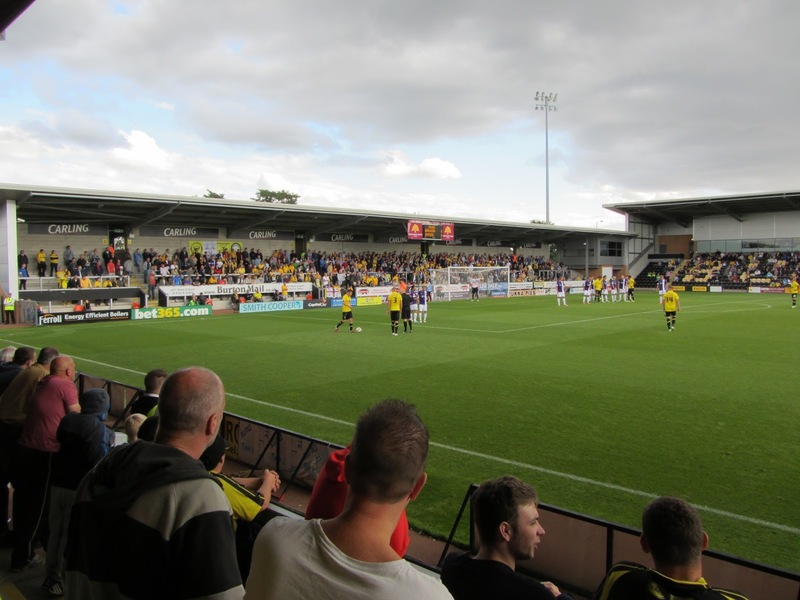 The first real action came in the 36th minute when Burton's Ian Sharps clashed with Oxford's Dave Kitson in an off-the-ball incident. Sharps received a straight red card meaning Burton had to play the majority of the game with only 10 men. Just after this the home side managed their best move of the game as Damien McCrory saw his close-range effort saved by Ryan Clarke in the Oxford goal. The disadvantage of being a man down caught up with the hosts in the second period as Oxford controlled the game. In the 49th minute they took the lead - Alfie Potter rode several Burton challenges before striking the ball past Dean Lyness. It was a well taken goal by Potter though the home defence should really have stopped him getting into a scoring position. Tom Newey almost doubled the lead a couple of minutes later when his rasping long-range drive brought a great save from Lyness. From this point on Oxford always looked likely to bag a second goal though it took until the 85th minute for it to come. Ryan Williams beat the Burton defence down the wing and his cross into the box caused a mix-up between Lyness and Rory Delap allowing Danny Rose to nod in the second goal to wrap up the victory.